The Beach Hotel has come a long way. It set a new record being sold for $65 million in early 2007 - contemplate that while you're sinking your next cold one. A great spot to study the waves, do some whale watching and see the sun go down behind the mountains. 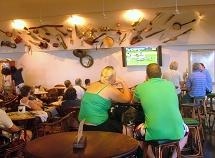 The Top Pub - as the locals call it - offers cold beer, pub lunches, fine dining, accommodation, surf videos, live footy, ocean views and live music. 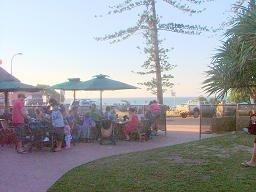 It's the most well known and popular of Byron Bays pubs, a focal point for the town and a prime meeting place. 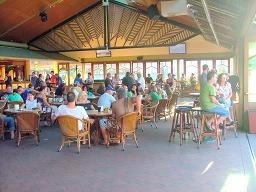 It has live shows three nights a week as well as every Sunday afternoon, featuring local, interstate and overseas bands. The renowned Fins Restaurant was located on the premises but has now moved and has a new home at beachfront Salt Village, Sth Kingscliff, 30 mins drive north of Byron. We now have the Pacific Dining Room taking it's place. The hotel serves lunch and dinner - good pub grub - cheap and cheerful style up to 9.00pm. There is free Wireless Broadband Internet connection available to everyone in the mornings. Just bring your laptop. Have a look at the Top Pub website.